“Inafune Juku”, is a school that teaches game creation. A school for future game creators. It is a school led by Keiji Inafune. Selected from more than fifty applicants, four young creators were chosen as the “first class” of Inafune Juku. 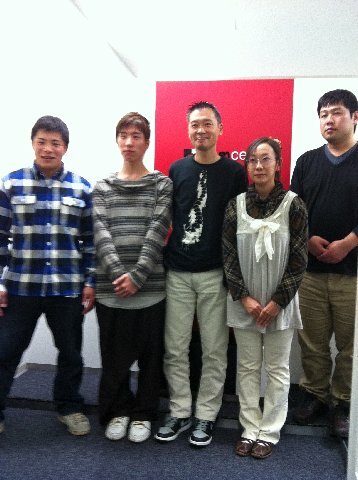 For the next three months, these students will come in to Comcept’s Osaka office twice a week to get lectures from not only Keiji Inafune himself, but also the creators of Comcept. The school opened on Nov.14th 2011, and the actual class started after lunch after a brief orientation. The first task for the class was to give a presentation of their game concept which they submitted as part of their application for the school. 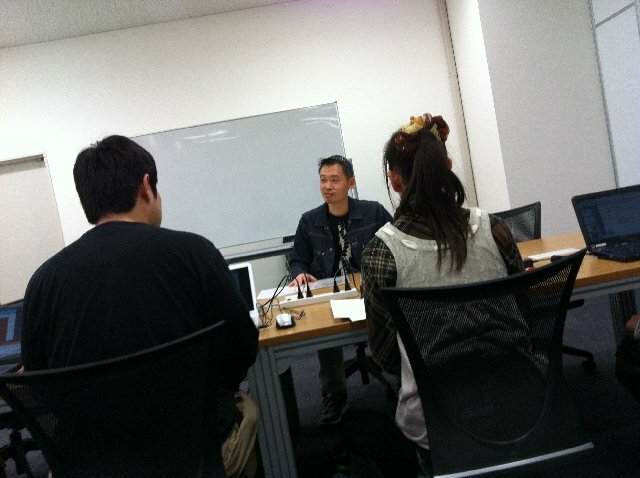 This should have gone very smoothly in any school, but this time, Inafune added a little twist to the task by saying “You will need to end the presentation in five minutes.” The students were shocked to hear this as they had thought they would be given all the time they need to present their ideas. The reason Inafune did this was to let the students know that in the business world, you may be only given 5 minutes of the executive’s time, and you have to throw in all the important essence into that 5 minutes. This is how Inafune Juku started, how will this first lesson end? We will find that out from the student’s own words. Since everyone is writing about how they felt, I think I’ll leave that to them and go for a different approach. The office was soooo clean. Well it’s only been a year since the company started so that’s natural. I saw some of the employees had toys on their desks. Everyone seemed so nice and easy going. We (the first class) actually had lunch with Inafune-san. We heard soo many funny stories of his son! I can tell Inafune-san LOVES his son. I’ll stop here because people don't like to read long notes. Until next time! First lesson, so nervous, but so excited. The day was so intense and dense. I felt so nervous during the first class. I prepared for the first presentation for few days, but everything changed with the “the presentation time is five minutes” I thought five minutes weren’t going to be enough, but it was the longest five minutes I ever felt… I actually finished one minute before, and I was so nervous that I had no idea what I was talking about. I learned today that the key here is to think “I have five minutes to talk all I want” rather than “I only have five minutes to talk”. I feel so lucky to be accepted as a member of Inafune Juku’s first class. My impression after the first day was; the lessons that Inafune Juku offers are so dense. The most memorable thing Inafune-san said was “you have to make decisions by yourself”. Making decisions means being proactive and responsible. I realized that that is very dificult for me. Here are some of Keiji Inafune’s very own words from the class room. “You are the one to decide how to use your brain. You are the one to decide how to think. That is what I want to show to this class”. “One thing that Japanese people do very often is ‘make a choice because someone else did so’. Use your own thinking process is very important in game making”.